NJM Group has a long history with ensuring safety and protecting assets at Melbourne Airport and a recent bump rail installation at the venue has solidified this relationship. These sleek floor mounted airport/ showroom type bump rails were installed at the airport terminal. 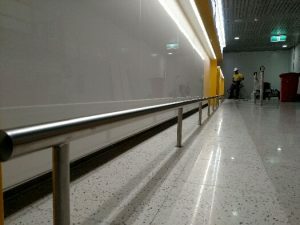 The tubular bump rail runs along the wall to prevent trolleys, luggage and buggies coming into contact with the glossy wall surface to protect it from scratches and dents. The bump rail has a stainless-steel finish to give the airport a professional look ensuring the protection does not come at the cost of aesthetics.